I think Twitter is great. I go on about it all the time to everyone I meet and justify my usage as ‘excellent professional development’. 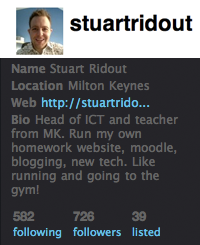 Today one of the ICT teachers from my team joined Twitter! Shane Gallaher @shanegallaher signed up. Apparently I joined Twitter on 14th May 2007. It doesn’t seem like it was that long ago but that’s what http://www.whendidyoujointwitter.com/ tells me. In that time it becomes easy to forget that the network is still growing and there are new users every day. We talk about hashtags and @ replies, DMs and TweetDecks with a carefree attitude and the newbies are sitting scratching their heads. So I went back to basics and wrote this post to help the newbies make the most of Twitter … quickly! Nothing is more frustrating that checking out a Twitter follower to find that their profile is empty. Lots of Twitter users will switch off at this point and will not follow ‘empty profile’ users. Upload a profile picture. It doesn’t need to be a photo (although I like to see who I’m tweeting with) but it should be something different from the default Twitter bird. Put in your location. Just the general area is fine but people like to know if you are in their town, country or continent! Fill in your bio. You’ve only got 160 characters so you need to make it snappy and interesting. People like to know what you’re all about and the lack of profile can turn a potential follower off. The beauty of Twitter is that it is a network but you need to follow people before other people will start following you back. If you don’t follow people, nobody will know you’re out there and nobody will see your brilliance. looking on a Twitter directory service like http://wefollow.com/ These sites hold directories of users in different categories so you can browse to find the most popular or useful people in your area of interest. by posting interesting stuff on Twitter. People will then retweet your tweet (see the Lingo below) and expose other people to your brilliance! 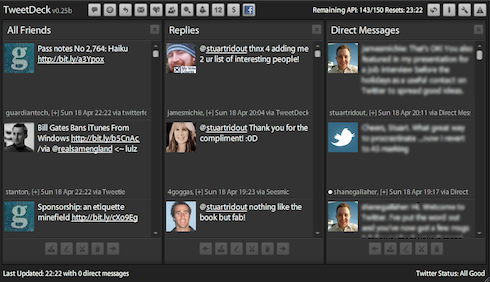 People start out by using the Twitter website but many move on to use a Twitter client as they find it’s easier. This is a program that usually runs in the background and alerts you when tweets come in. This means you don’t have to keep checking the website and means you can respond to and interact with tweets much more quickly. This tweet was originally posted by @tombarrett and if you think this is interesting you might choose to follow him. Sometimes people use a ‘hashtag’ to indicate they are discussing a certain topic. This is useful as it allows you to search for all tweets about that topic. This post uses a hashtag #newleaders which is about leadership tips. If you click on #newleaders you would be able to view all the tweets about this topic. Everything you post in your Twitter feed is public (unless it is a protected Twitter account) so you need to be aware of that. If you want to send a private message to someone you can do so by using a direct message or DM. You can only send a DM to someone who is following you. If you do send a DM to someone make sure you are following them otherwise they can’t DM you back! Tweets are limited to 140 characters so usually people use a web shortening service such as http://bit.ly to shorten any web addresses. Many of the desktop or mobile clients will do this automatically. ← Can you afford to integrate free tools into your curriculum?